Pdjr9000 has been blocked indefinitely from editing the Super Mario Wiki for numerous violations of MarioWiki policy, both major and minor. See the block log and block time remaining. No swearing, especially not the F-word, the longer B-word or the C-word, which is the worst word of all. But you can't get away with saying even the P-word, the mildest bad word, either. No vandalism, trolling or spamming. Please stop forgetting to use italics on the Super Mario Wiki. This isn't a warning, and it's possible that you made a mistake by accident or without realizing it; this is simply a reminder for your information. If the action continues, then a warning will be issued. Thanks for reading and keep contributing. Fine. I reconsidered, and I thought a warning's a bit too harsh, so there, I removed it. Sorry. The warning was for not following advice, not because you're expanding articles (I never said that). What you're doing now (expanding) is excellent - keep it up! I told you more than once to use italics, so I thought that you should remember. By the way, saying "NO WARNINGS" doesn't mean that you won't get any. Sir, i don't know what you're referring about, but you said about my edits is a violation of the Courtesy policy (in case you didn't know) about Discourteous Behaviour. And you just speak unkindly of a user/other users, either behind their backs or to their faces. Everyone has a different unique style of what they edit, and you shouldn't go to someone talk page and insult them about their editing skills but just giving them advice they should require. Sir i recommend you change that catty and delusional behaviour or you'll be blocked again. 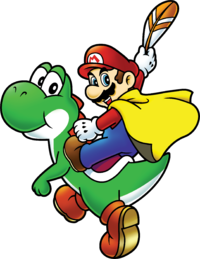 This is a warning to stop your inappropriate behavior (reverting articles) on the Super Mario Wiki. Please adhere to the rules or you will be blocked from editing this site. As Mario jc mention, some games that were released outside few regions will, almost certain won't be released in the rest. Unless Nintendo announce they will. Please stop adding speculative and unnecessary info to articles on the Super Mario Wiki. This isn't a warning, and it's possible that you made a mistake by accident or without realizing it; this is simply a reminder for your information. If the action continues, then a warning will be issued. Thanks for reading and keep contributing. I'm not sure if a Last Warning isn't too harsh. I think you should think again. What do you have to say now???????????????????????????????????????????????????????? This page was last edited on September 19, 2013, at 17:27.